Flushing is the center of Asian-American political life in New York City. As more Asian-Americans take interest in public office, the Queens neighborhood is becoming an increasingly competitive arena where any position is hotly contested. Koreans are the latest group to try to use Flushing as a springboard to political power. A diverse community where more than half of the residents are Asian, Flushing has been the site of many milestones in the history of Asian-American politics in New York. In 2001, Flushing elected the first Asian-American city councilmember, John C. Liu, who went on to become the city’s comptroller, making him the first Asian-American to hold citywide office. 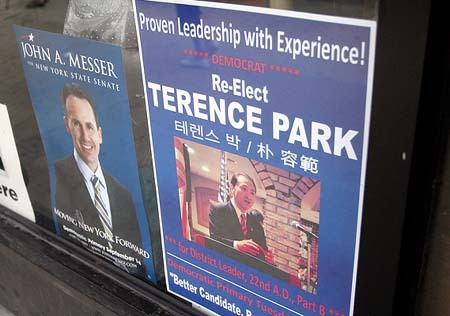 The district also elected the first Asian-American to the State Assembly, Jimmy Meng, in 2003. He was succeeded in 2005 by the first elected Asian-American woman, Ellen Young. Although Chinese-Americans like Liu, Young and Meng dominate Flushing politics, Korean-Americans are now trying to enter the field.